The Managing Director of Innovative Staffing Solutions, Arnoux Maré, explains that the company is all about doing what it can for its employees and their families. “If you look at statistics, for every person that’s employed at least 11 others are able to put food on the table,” says Maré. “I am very family orientated and therefore work together as a team with my fiancé, Salomie Storm, to bounce ideas off each other to see ‘what’s missing’ in terms of benefits for our employees and value-adds for our clients,” he adds. Maré is also the Chief Executive Officer of the Innovative Solutions Group™, of which Innovative Staffing Solutions is a subsidiary. The group, which provides effective outsourced services and solutions to companies across the country, incorporates 17 subsidiaries and over 8 000 full-time employees. 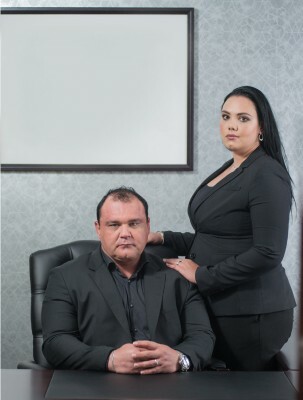 This success is thanks to Maré, who in a mere six years grew the R500 start-up into an empire with a R780-million turnover. Maré launched Innovative Staffing Solutions in 2013 when he realised that the only way to mitigate his clients’ labour risk was to bear it himself. The company employs the workforce needed by its clients on a full-time basis and places appropriately-skilled Innovative Staffing Solutions’ employees with its clients, thereby assuming the responsibility and accountability for its clients’ labour needs. Despite the huge number of people in its employ, Innovative Staffing Solutions has not experienced a single incident of labour unrest in its years of operation. “Knowing that their workforce is well taken care of, is trained and productive, enables our clients to focus on their core business capabilities and grow their businesses. “Outsourcing their staff to us reduces their business risk, in terms of industrial action, and enables them to spend capital funds on their business, product or customers. Management and other key resources can focus on strategic business functions, instead of day-to-day staffing duties,” Maré explains. Innovative Staffing Solutions continues to forge new and inspiring paths in the outsourcing sector. In 2017, despite a very challenging economy, the company employed one person for every working hour in the year, across various industry sectors, including transport, engineering, manufacturing, logistics, hospitality and agriculture. This is an extraordinary feat if one considers that Statistics South Africa stated that businesses shed 31 000 jobs in the third quarter of 2017, across numerous industry sectors, including mining (9 000), service industry (6 000), manufacturing (5 000) and electricity (1 000). “We are elated that we have changed many lives by permanently outsourcing employees to new job opportunities in the various industry sectors in which we operate. This is evidence that the outsourcing industry is a key enabler of much-needed growth and full-time job creation in South Africa,” says Maré, who believes that the outsourcing industry could effectively tackle the 26.6% unemployment scourge in South Africa. “South Africa is in a position to emulate the success of countries such as India, which has created 2.8 million jobs, and the Philippines, which has created 750 000 jobs, through outsourcing. The outsourcing industry can therefore become a substantial job creator and a meaningful component of our Gross Domestic Product,” Maré confirms. The Innovative Solutions Group™ is living proof that business can not only survive, but triumph in a tough economy. “A hard economy doesn’t really touch on business-to-business services because business needs certain key services to survive. When times get tough the market looks for the most reliable service providers to ensure cost efficiencies. We have made sure that we are that supplier. We improve service delivery, market harder and work harder. The services that we offer are essential to every business, they are not luxury items,” says Maré, who therefore believes that ‘there’s no such thing as a tough economy’. One of Innovative Staffing Solutions’ latest ideas was to come up with a unique in-house medical aid plan for its truck drivers and their dependents. The company joined hands with one of the largest medical aid schemes in South Africa to offer its 5 500 truck drivers the most affordable and comprehensive medical aid package in the country. “Usually, a medical aid plan of this nature would cost R1900 a month and would thus not be affordable for an individual who only earns about R9 300 a month. However, following months of negotiations with the medical aid scheme, our drivers are only paying R300 a month for this high-end medical aid which came into effect on 1 March 2018,” Maré explains. With an estimated 44 million South Africans unable to afford private medical aid rates, there’s huge pressure on the country’s public health system. According to statistics, South Africans visit a public health facility about two-and-a-half times a year and, on average, there’s only one doctor available to care for 4 219 patients. Truck drivers contribute significantly to South Africa’s economy, as they ensure that goods reach their destinations across the country. However, they face significant challenges in their working environment, including driving their 50-tonne trucks over long distances, at speeds of up to 120 kilometres per hour. “Due to their long hours and extended concentration levels, truck drivers are naturally more vulnerable to road accidents. Ensuring their health and wellness is thus imperative for Innovative Staffing Solutions, not only for our drivers and their families, but for other road users as well,” says Maré. The company’s new medical aid plan is comprehensive and includes unlimited visits to doctors within an approved network, basic pathology and radiology, ambulance services, medical procedures in general practitioners’ rooms, certain dental procedures, eye tests and free prescription glasses every two years, hospital cover for trauma up to R100 000 per year for serious accidents and cover for most chronic diseases and medication. “We moved away from the industry’s wellness scheme for truck drivers, which only offers a limited healthcare programme with no hospital cover, because we wanted to ensure the health and wellbeing of our drivers by giving them access to the best options and benefits available in the market,” says Maré. “Not only does this ensure that they now have a rewarding working environment, it also means that their families don’t have to worry about them when they are on the road,” he adds. South Africa’s roads are renowned for claiming many lives every year, with a notable increase over the festive season. According to the World Resources Institute, South Africa ranks 42nd in terms of road fatalities. In addition, figures from Arrive Alive indicate that 27.5% of road accidents are caused by trucks and light delivery vehicles, with 4.8% of these being caused by trucks. Whilst this percentage may seem low, there’s usually a high number of fatalities when a truck loses control. In addition, the direct cost to the economy, including clearing the accident scene, hospital care and police time, was estimated at R306 billion. There are also indirect costs, including the number of work hours lost, delayed deliveries and damaged cargos, which results in increased insurance premiums. Road freight remains the preferred method of transportation for many South African companies because it offers better availability, reliability and cost efficiencies, when compared to rail. “Heavy vehicles are therefore integral to efficient supply chains. Without them, the supply chain would be compromised as goods would not reach their markets timeously. “In fact, truck drivers transport over 88% of South Africa’s cargo around the country and as such they are as much an asset to their companies as the formidable vehicles they drive. They need the ongoing support of their fleet managers. Putting measures in place to reduce the number of truck-related accidents is thus imperative,” says Maré. While a single approach can’t improve truck driver competency there are solutions to reduce the number of accidents involving commercial vehicles, including the combination of regular driver evaluation and corrective training, fleet technology monitoring systems and close management of drivers’ schedules to prevent fatigue and negligence. “The safety of our employees and our clients’ equipment is of the utmost importance, which is why we constantly find new and innovative ways to improve driver competences. For example, the Innovative Solutions Group™ recently invested in a Renault Kerax truck and a Volvo truck which enables the company to train one truck driver every one-and-a-half hours. Almost 600 drivers have been trained since January alone. “This dedicated on-site truck benefits our clients by significantly reducing their truck downtime and ensures that all drivers are properly trained in safety regulations and provided with measures to guarantee their own and others’ safety on the roads,” says Maré. Innovative Staffing Solutions’ control rooms are also manned 24/7, 365 days a year. The company’s dedicated controllers, who each oversee approximately 40 trucks and their drivers, constantly provide feedback on driver behaviour and potential issues that could affect operations. “It is important to provide our clients with industry accident trends and to alert them to an escalation in the number of accidents,” confirms Maré. One of Maré’s passions is the Innovative Staffing Solutions’ Driver Training Programme, which enables inexperienced Code 14 drivers to shadow more knowledgeable drivers on the team, allowing them to hone their abilities through on-the-job training and mentorship. “The programme has been very successful, and we train about 1 000 drivers a year. In successfully growing and upskilling them, the results have been a more dedicated, loyal and productive workforce,” says Maré. “Our holistic training course for drivers ensures that they are more than roadworthy. It is essential for transport and logistics companies to make sure that their drivers are not only well trained, but that their fleets are managed with precision. We offer a 360-degree service to transportation companies, from fleet service management to driver training,” says Maré. Driver fatigue is one of the greatest challenges faced by South African truck drivers. Many logistics companies struggle to fill their quota of drivers, which often forces managers to demand longer working hours, resulting in fatigue and drivers not being able to be taken off their shift for training. “Fatigue affects truck driver competency in various ways, from slowed reaction times to a lack of concentration. We are thus adamant that our drivers take regular breaks and get the rest they need during long trips,” says Maré. “Less fatigue and fewer accidents result in a decline in delays, increased productivity and an improved bottom line, all of which assist our clients to improve their operating costs and enhance their reputation,” he adds. Recent studies indicate that South African businesses favour outsourcing more highly than their global counterparts. Whilst outsourcing’s cost savings and process efficiencies are globally recognised, some companies are still sceptical about utilising outsourcing service providers. “Whilst business leaders worry about losing control of a key process, a high cost of implementation or retrenching current employees, these are mere myths,” says Maré. “Our outsourcing solutions are designed to simplify systems and lessen our clients’ workload, enabling them to do what they do best, while we focus on our core capability - their staffing needs. We also address skill shortages for our clients, through a continuous process of learning and growth,” he adds. The biggest challenge faced by Innovative Staffing Solutions is educating the public and private sectors about the difference between labour broking and the staff outsourcing service that it provides. “Whilst outsourcing might not appear be a money-saving method in the short term, in the long run it is just that.” Maré explains that if, for example, a company doesn’t outsource its IT function, it needs to engage the services of an employee to ensure that the IT systems are well-managed, and no downtime is experienced. “In the event that the employee falls ill, or faces family responsibility leave, it would be an infringement on the employees’ rights to expect him or her to come to work to prevent IT downtime. If, however, the company outsourced its IT function, this scenario could be prevented. In this instance outsourcing ensures better opportunities for career advancement for these employees,” he says. Since taking over the site under two years ago, there have been no serious industrial issues and not a single serious accident involving any of the drivers. In addition to never facing a serious industrial relations dispute, Innovative Staffing Solutions has also never had to retrench an employee and its workers are always taken care of. “In the event that an employee makes a mistake, we ensure that the case is thoroughly investigated and dealt with fairly in terms of labour legislation. In fact, during the national transport strike our drivers continued to drive, knowing that we would treat them fairly based on the outcome of the negotiation process the Bargaining Council was involved in. We went above and beyond the call of duty to ensure the safety of all of our drivers by arranging safe transport from their homes to their various sites of employment. By treating employees justly and ensuring that their rights are not infringed upon, we have been fortunate enough to have never had a strike,” says Maré. “Numerous clients have experienced significant increases to their fleet sizes due to more efficient systems, more productive workforce and little to no industrial action.” says Maré. He is confident that the Innovative Solutions Group™ - which has its head office in Pretoria and offices in all major operational areas across the country, including Nelspruit, Komatiepoort, Bloemfontein, Kimberly, Cape Town, East London, Port Elizabeth and Limpopo–will continue to lead the outsourcing industry in South Africa and will employ 15 000 people by the end of 2018.